The Lean business practice methodology is becoming ever more popular in the construction industry. Many leaders in the field are investing in technology to support the organization’s improvement efforts and to ensure the spread of the Lean mindset. Those who choose the right solution and implement it successfully have found that it has a significant impact on their ability to root out waste, create a safer work environment, and achieve lasting improvement momentum. Most people don’t shop for Lean construction software every day, so we’ve put together some of the most important features to add to your checklist. Perhaps the most important thing that Lean construction software does is create a central location for collecting all opportunities for improvement. One of the central principles of Lean is that improvement is everyone’s responsibility and that the most meaningful positive change originates with those closest to the work. Therefore, everyone should have the ability to contribute ideas. In construction, it is particularly important that the solution be available from any device at any time. Huddle boards are popular with many organizations because of their power to keep improvement work top of mind, organize and manage change, and get instant insight into the health of Lean in the organization. But the traditional model of a physical huddle board hanging on a wall in the workspace comes with some big limitations, especially for construction. That’s why it makes sense to look for Lean construction software with customizable, digital management boards. 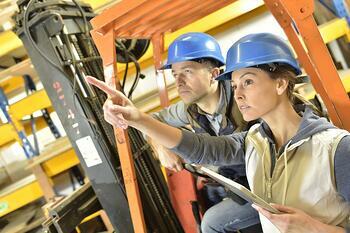 The practice of Lean in construction requires data-driven decision-making. Leaders must have the ability to analyze trends and drive the organization toward strategic goals and objectives while making smart game-time decisions. 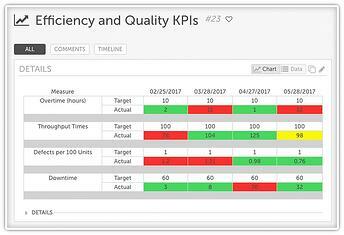 Your Lean construction software should support this with easy access to improvement metrics in charts and graphs that update automatically as new information comes in. They should be readily accessible to everyone from the front line to the C-suite. The ability to search your Lean database is a simple idea, yet it is incredibly important. The information in your Lean construction technology represents your organization’s repository of improvement related knowledge. You should be able to easily search by topic, department, design stage, sub-specialty, or status. The best solutions let you filter results so that you can quickly get answers to whatever question is on your mind. 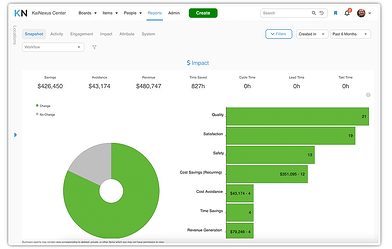 The Lean construction technology solution you select should have the ability to produce reports that give you details about the impact improvement work is having on your projects and the organization as a whole. You should be able to dig into which employees and teams are most effectively engaging in Lean so that you can recognize and reward success. Alerts and notifications help keep everyone on task with their improvement work and they help to ensure that projects don’t lose momentum. Of course, you don’t want people to receive so many alerts that they start to ignore them, so look for a solution that gets the right balance between useful information and too much noise. Everyone should get the right information at just the right time. Construction projects typically take a significant amount of time, they involve a number of different teams, and they don’t happen in an office. That makes cross-functional collaboration all the more difficult and all the more essential. 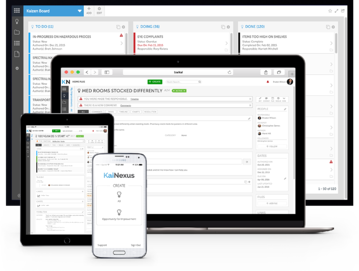 Your Lean construction software solution should streamline collaboration between multiple constituencies. All of the necessary documentation and notes about improvement efforts must be in a centralized location with easy access for everyone. Comments, metrics, status updates, and other details should keep everyone on the same page when it comes to your Lean initiatives. As you consider your options for Lean construction software, keep in mind that it isn’t a matter of which one has the most features. There’s no need to invest in a bunch of extra bells and whistles that no one really needs. (Lots of software vendors are guilty of the Lean waste of over processing.) But the features we’ve listed above are truly essential and should be available in any solution you seriously consider. When you find the right solution, you’ll take a huge step toward cementing Lean as the way you do business.